Yesterday, we drove up to Elkridge, Maryland to meet up with Victoria and Ryan! They are getting married in 2018 at the beautiful Elkridge Furnace Inn, but we decided to mix it up and spend their engagement session at The Belmont Manor. The grounds here are just absolutely stunning and the French architecture just matched perfectly with Victoria’s Beauty in the Beast theme! Victoria and Ryan met back in high school at a mutual friend’s party. After Victoria had left, Ryan had asked her sister who she was and told her that he was going to marry Victoria! Not long after, they were officially introduced and nine years later, Ryan proposed to Victoria in the Outer Banks! They decided to up to the Currituck Beach Lighthouse and when they got there, they realized that the lighthouse only accepted cash! So they had to drive a couple miles to a gas station to get cash for their entry, waited in a long line all over, walked the 220 steps to top, and Ryan finally got to pop the question! Talk about anticipation! The anticipation hasn’t stopped there, because this session was actually a rain date session! Our original engagement session date with Victoria and Ryan was rained out – thanks to all of this crazy Maryland weather. But it was worth the wait! Here are our favorites from the day! 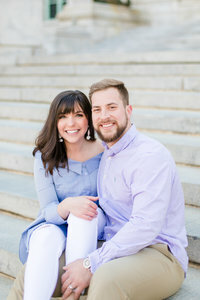 To view more engagement sessions, browse the links below!